Life is hard. Species can die. In fact, the human race would have died long ago if it weren’t for the fact that our bodies are designed to adapt to a constantly changing environment. Evolution could be called adaptation, because the ability to adapt is the one feature that keeps all life upon Earth alive and functioning. 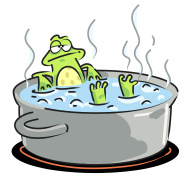 In th e laboratory, it has been noted that a frog can be heated in a beaker of water to a degree that would normally be fatal, but it remains alive because it has had the time to adapt to the increasing temperature. Had the frog been suddenly exposed to water of such high temperature, it would have been unable to survive. Charles Darwin, the pioneer of evolution theory, was a trained minister of religion as well as a naturalist. He thought long and hard about releasing his findings about the natural evolution of the species because he was keenly aware of the materialistic element in society which would use this information against religion. He was right, of course. Others used his work to claim that there was no need for divine selection when natural selection occurs automatically. They have since gone on to claim that all life could have risen from prehistoric sludge completely by accident. What they don’t even begin to explain, however, is the existence of consciousness in all of this. Consciousness is necessary for natural selection and adaptation to occur. If you move from a hot climate to a cold climate, you will adapt to the new environment, but first you had to have the consciousness to decide upon the move and make the adjustment. What is consciousness? It is certainly more than a few electrical signals bouncing around inside a brain. Computers can mimic some limited aspects of the brain such as human logic, but they are not self-aware. There isn’t a computer in the world that can think for itself. Computers just follow sets of preset rules, and they do so as quickly as possible. Behind all forms of consciousness is awareness. A sense of being is fundamental to all life because all life is constructed from consciousness. Even a solid object like a rock is composed of original thought and original feeling set into motion. All of life is contained within the consciousness of the original Creator, including the prehistoric sludge from which the first biological cells were formed. Human beings were originally designed and then evolved within the framework of a conscious universe, one created and developed by the original Creator. It took billions of years for planets to form and biological life to emerge and evolve, but remember this: Time is a creation of the Creator. The Creator does not have to wait billions of years to see a biological process emerge. Everything happens in the Now – just different parts of the tapestry of time, which the Creator sees as a whole. The whole design, inception, development and evolution of the universe is happening right now, within that overview, as seen by the original Creator. A little tweak here and there along the timeline can produce a perfect rendition of any form of biological life. Life is too interesting to create in one Big Bang and then just watch it unfold, as if on auto-pilot. Life is a work in progress, a true work of art, and the Creator has the ability to make adjustments at any point along the timelines. Science today searches for answers, but what it really needs is a valid search path. Life did not begin by accident. It began by design. Those branches of science which include the presence of consciousness will find the answers that they seek when they include the existence of original consciousness and intelligent design in their search. This entry was posted in Owen K Waters, Spiritual Dynamics on August 19, 2015 by Owen K Waters.